The Thunder, in conjunction with the Eastern League, are pleased to announce that Thunder GM/COO Jeff Hurley has been named the 2018 Eastern League Executive of the Year. Hurley will be presented with the award at the Baseball Winter Meetings in Las Vegas, Nevada during the Opening Session on Monday, December 10. "I want to congratulate Jeff and our entire staff for a fantastic 2018 campaign," said Thunder Team President Joe Finley. "Jeff's leadership has been paramount to the franchise's success for years and I am thrilled to see him and our staff recognized for their hard work and creativity." Hurley becomes the fifth Executive to earn the award in franchise history following Wayne Hodes (1995 and 1998), Rick Brenner (2003) and Will Smith (2011). "Jeff's selection for this award is well deserved recognition for the outstanding job he has done not only this season, but during his entire tenure with the Thunder," said Eastern League President Joe McEacharn. "The outstanding efforts of Jeff and the rest of the staff in Trenton were on full display with their excellent performance in planning and hosting the 2018 Eastern League All-Star Classic. Those efforts alone would be enough to recognize Jeff and the Trenton organization, without taking into account the fact that the Thunder also provided their fans with a full season worth of fun and excitement they've come to expect at ARM & HAMMER Park while celebrating 25 years of Thunder baseball." 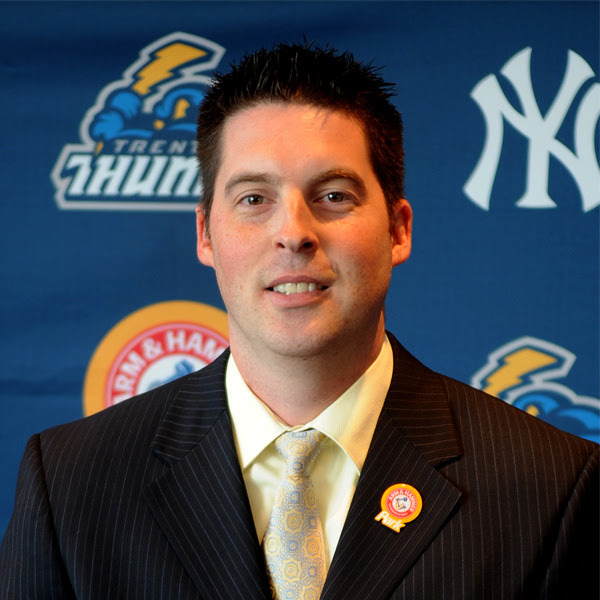 Under Hurley's leadership, the Thunder recently completed their 25th season at ARM & HAMMER Park; a campaign that hosted three of the 20 largest crowds in franchise history. The Thunder welcomed a total of 351,297 fans which was the fourth highest total in the Eastern League and the highest total for the franchise since the 2014 season. The 2018 Eastern League All-Star Classic, presented by Horizon Blue Cross Blue Shield of New Jersey, welcomed the 9th largest crowd in franchise history when 8,296 fans watched the league's stars face-off on Wednesday, July 11. In addition to hosting the 2018 Eastern League All-Star Classic, the 2018 season featured a year-long celebration of the 25th anniversary of Thunder Baseball. With a nod toward the history of the franchise to celebrate the anniversary that included a special starting nine bobblehead set of some of the top players in the club's history; Hurley also oversaw the team's re-brand as the Thunder Pork Roll for Friday night home games and continued the franchise's efforts in the community raising money and awareness for hundreds of charitable causes while continuing the team's own charitable efforts like the F.I.E.L.D. Program which focuses on renovating youth baseball fields in the area. A Hamilton native and Steinert High School graduate, Hurley just completed his third season as Chief Operating Officer and General Manager for the Thunder and his 15th overall working for the franchise. After playing baseball at DeSales University in Allentown, PA and graduating with a degree in Accounting, Hurley joined the Thunder front office as an intern for the 2004 season. In his career, he has held the titles of Group Sales Account Representative, Media Relations Assistant, Community Relations and Baseball Operations Manager, Baseball Operations and Accounting Manager, Director of Finance and Baseball Operations and Chief Financial Officer. Hurley was promoted to his current role of Chief Operating Officer and General Manager following the 2015 season. In addition to his role with the Thunder, Hurley has served as a member of the Robert Wood Johnson University Hospital Hamilton Young Professionals organization since 2013 and was a member of the RWJUH Audit Committee for one year in 2016. In 2017, Hurley was recognized as the Robert Wood Johnson Young Professional of the Year as voted by his peers. Hurley also site on the Board of Directors for the Hamilton Area YMCA, Miracle League of Mercer County and the MidJersey Chamber of Commerce, the Executive Leadership Committee for the American Heart Association and the Hamilton YMCA Advisory Council.